Anthony Rafferty is an Irish scientist based in Melbourne Australia. In the course of his career he has studied several species of turtle, with particular emphasis on their embryonic development. His body of work includes a fascinating study, published earlier this year in the American Society of Naturalists journal, in which he describes some of the biological limitations that prevent turtles from evolving towards viviparity. I am currently a Postdoctoral Research Fellow with the Murdoch Children’s Research Institute and Royal Women’s Hospital in Melbourne, Australia. I also work on a part time basis with Monash University, Melbourne, investigating embryonic development and the evolution of live-birth in reptiles. It was only during my masters at Duke University, USA, that I realised a career working with turtles was possible! I took a fantastic sea turtle class with Drs Karen and Scott Eckert during my time at Duke, which opened my eyes to the world of sea turtles and the extensive network or sea turtle biologists that exist around the world. As part of the course, the Eckert’s brought the class to Trinidad to help with a conservation project for the critically endangered leatherback turtle. It is awe inspiring watching these 6 foot, prehistoric looking creatures crawl up the beach every night to lay their eggs. The class was absolutely fantastic and the efforts of the Eckerts inspired me to get involved. After taking two years to travel and decide what I wanted to do after secondary school, I went back to University College Dublin to undertake a four year Bachelor of Science Degree in Zoology. My undergraduate advisor, Dr Tasman Crowe, is still to this day one of the best mentors I have had. He encouraged me to look into postgraduate courses, which led me to the USA to do a Masters in Environmental Management with Duke University. The decision to follow a more management-based path at this stage related to my desire to work with both animals and people. I had also completed a short bursary position with the Irish Marine Institute during my time at UCD that spurred my interest in fisheries management. It was a very exciting time and the Masters course was exceptional. I also completed a two year graduate certificate in geographic information systems at Duke and the facilities for this were excellent. I hadn’t even dreamed of the opportunities that presented themselves to me during my time in the states and it really opened my eyes to what work / research was being done globally. I attended yearly international sea turtle conferences and became familiar with many of the friendly faces in the turtle community. Shortly after graduating from Duke I was accepted onto a PhD program at Monash University, Australia, and for several months prior to my move, I was consulting on several fisheries management projects along the Southern Coast of California. The management work was fantastic but I felt I wasn’t being exposed to much “science” in the role, which cemented my desire to do an applied research PhD. The main reasons why I chose to move to Australia were because I loved to travel and the scholarship opportunities were exceptional compared to other locations (Ireland and USA). My PhD took 3.5 years from initiation to completion and I worked with 2 species of marine and 3 species of freshwater turtle. Australia is a fabulous country and the diversity of fauna is outstanding. It really made for some interesting research and I got to visit beautiful places including islands on the great barrier reef!! 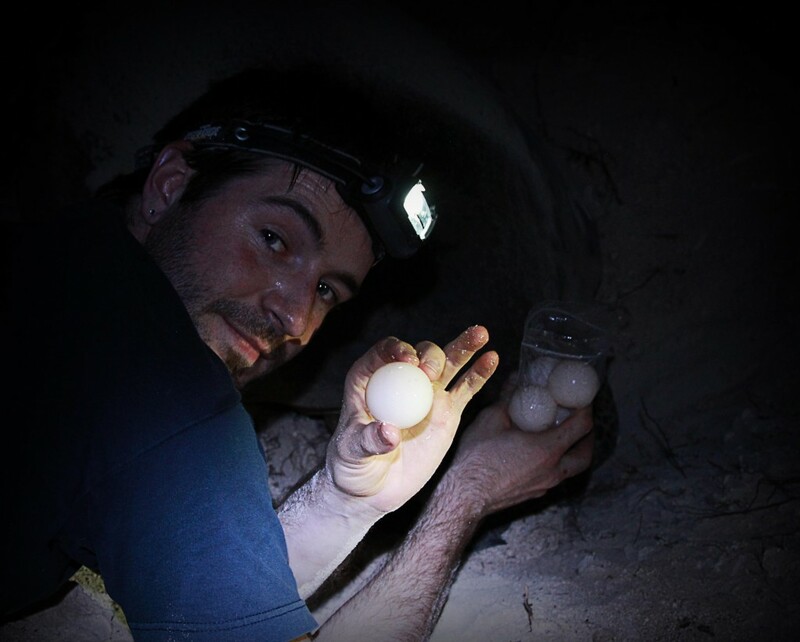 My PhD research primarily focused on the evolution of live-birth, and the mechanisms controlling it, in reptiles. Interestingly, over 100 species of lizard and snake have evolved the ability to give birth to live young (instead of laying eggs) but it has never evolved in turtles. The reason for this is that embryos of all turtle species undergo a process called pre-ovipositional developmental arrest while they are still inside the mother prior to being laid. This prevents advanced development in utero and therefore prevents the evolution of live-birth in this group of reptiles. The most exciting finding from my research was that really low oxygen levels inside the reproductive tracts of female turtles cause their embryos to stop developing until after they are laid. What I enjoyed most about the research was seeing it unfold from start to finish. I got great satisfaction from formulating the questions, planning and executing the experiments and then writing up the results for publication. Seeing your name printed on your first publication is wonderful! Do you have any ongoing research you would like to talk about? Currently, I am assisting with the supervision of two students that are following on from my PhD research. The aim is to now apply our skills and knowledge of sea turtle embryonic development to other reptile species to investigate the influence that oxygen availability inside the mother has on the development of her embryos. Network with enthusiasm!! All of the fantastic opportunities that came my way were a result of good recommendations from people I had gotten in touch with, often by just sending emails to express an interest in their work. I think people like to see you are keen to learn and enthusiastic about getting involved. Also, I wholeheartedly advise spending time investigating what opportunities are out there. When I left Ireland and moved to the states I wasn’t really aware of the breadth of what was being done around the world. If you have an interest in something, take some time to research it online and get in touch with the experts!